All seven leather seats in the GX460 are extremely inviting, and provide the extra lateral support needed for off-road driving. The second row, with its folding center armrest, can slide 135mm backwards or forwards for extra space and legroom. The third row is accessed by an innovative ‘walk-in function’ for the second row seat behind the front passenger’s seat that folds it forward when required. High-quality perforated leather seating is standard on the GX460, with bespoke semi-aniline leather available as an option. The driver and front seat passenger can also enjoy Ventilated Seats with heating, with ventilation blowers installed in the seatback and cushion (Optional). Heated outboard second row seats are also available as an option. Changing the seven-seat configuration in the GX460 is easy. The second row seats can split 40:20:40 or be reclined. A power mechanism for the third row seats lets you effortlessly fold one or both seats fully flat to accommodate bulky items (Optional). There is also a convenient glass hatch in the back door that lets you load the vehicle without having to open the back door in tighter parking spaces. Other thoughtful details include a conversation mirror in the overhead console for easier communication between passengers; a compass integrated in the interior mirror; 3 power outlets (one optional); and an optional cool box in the center console box. 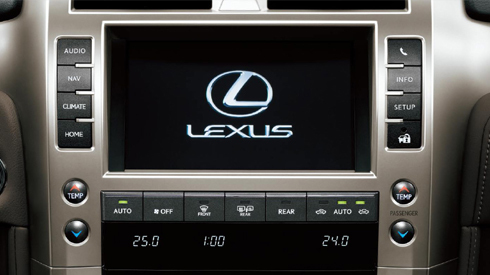 The advanced yet highly intuitive Lexus Navigation System with Bluetooth® function is easy to use. Directed either by voice command or using the touch-screen of the EMV (Electro Multi-Vision) display, the system will quickly guide you to your destination. One of the fastest and most user-friendly navigation systems available today, it features a dual-map display (large scale and small scale. Once you arrive, parking the GX460 is easy, thanks to its Parking Assist Monitor (Optional) and Wide-view Front & Side Monitor system (Optional). Images from the front, rear and front passenger’s side cameras are displayed on the EMV display screen, to give you a clear view of potential blind spots and help you to avoid obstacles. In addition, the Lexus parking assist-sensor (Optional) provides advance sound warning if any object is too close to the vehicle. The GX460’s interior warms up as quickly as it cools, thanks to separate air conditioning compressor units in the front and rear of the vehicle. For colder climates, these operate at twice the output of conventional systems, and have been extensively tested in extremes from -45°C right up to +45°C. Further comfort is provided by Ventilated Seats with heating for the front seats (Optional), heated outboard second row seats (Optional), and Heated steering wheel. The auto air conditioning system features triple-zone independent temperature controls which enable the driver, front seat passenger and rear seat passengers to control individual climate zones according to their requirements. The electronically modulated KDSS (Kinetic Dynamic Suspension System) uses a hydraulic system that connects the front and rear stabilizers, and controls them in response to the driving terrain, to realize both excellent on-road ride comfort and off-road driveability. In on-road driving, KDSS suppresses body roll, contributing to excellent stability, control and ride comfort when cornering. In off-road driving, KDSS keeps all tires firmly in contact with the ground even when traveling over rocks and other demanding terrain, providing outstanding traction for excellent rough-terrain driveability and control, contributing to the enjoyment of a secure and stable ride. AVS (Adaptive Variable Suspension system) minutely controls the damping force of the shock absorbers independently on each of the four wheels, providing excellent stability, control and ride comfort in various driving conditions. The electronically controlled rear air suspension enables you to adjust vehicle height. The full-time 4WD system features a transfer switch for changing between low-range and high-range drive. The center differential uses a TORSEN® LSD (Limited Slip Differential) that can instantaneously optimize the front-to-rear distribution of torque according to driving conditions. Without accelerator or brake pedal operation, Crawl Control enables driving at a very low vehicle speed just by steering operation, reducing the demands on the driver in off-road driving. At the same time, it suppresses wheelspin and wheel lock-up by independently controlling each of the four wheels.